A quick search of the blog turned up zip on today’s featured bird which is a tad bittersweet. On the sweet side this means an official new check mark in the bird list – yeah!. On the less sweet side it means I do not have any better pictures of this bird. If the Nuthatch shots in the previous post were a step forward, this just might be a tiny step backward (for the moment). This has to be one of the easier birds to identify. Not a lot of birds out there sporting a dominant color palette of orange and black. 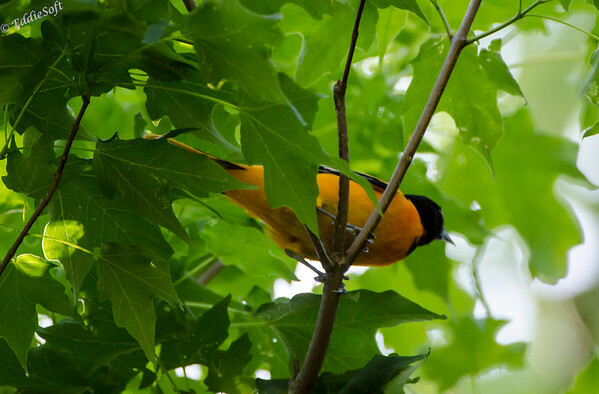 When you see one, most of us immediately think Baltimore Oriole. 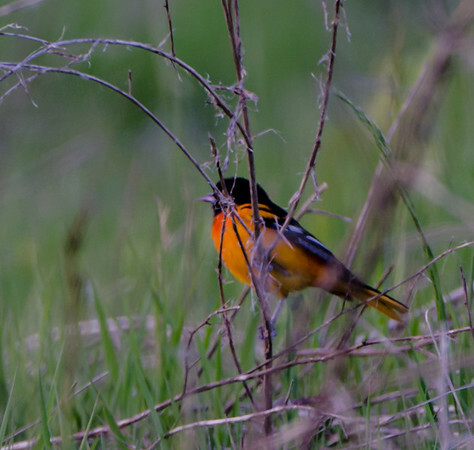 There are some variations of the Oriole and an orange bearing Redpoll, but for the most part this bird stands out on its own – and not hurt by having a Major League Baseball team named after it. Since the previous shot was rather weak when it comes to bird photography, I went in search of a better one. All the archives could produce .. of those processed to this point .. was the following flight shot which lacks some crispness on the body, but I do like the motion composition in the wings. My major problem is every time I see one of these beautiful birds, I’m sans camera – cue the Pileated Woodpecker lamenting. Clearly they know this and just do it as a means to taunt me for not catering to their feeding needs. There are seed and nectar feeders in the yard, but no fruit feeders. They just seem like too much work for a limited number of opportunities to actually see them. At least the Hummers basically hang out in close vicinity – these Orioles are a bit of recluse in my opinion. According to Cornell, they do not prefer the deep forest which may be one reason we have limited access to them (we live in the middle of a forest). They do make one cool nest – looks like a hanging sack of string. There are no shots of one in this set, but there are a couple in the hopper from another shoot – at the time I didn’t know what bird it belonged to, but solved that while researching for this post. 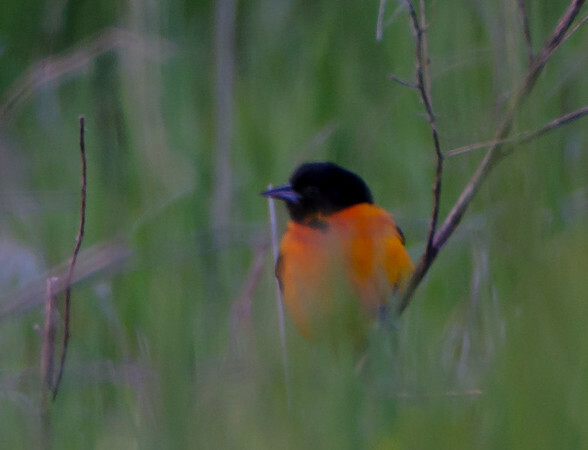 Hit the jump to see some less than spectacular shots of the Oriole. Here is a another less than stellar shot taken at Banner Marsh. This one refused to make itself visible as I was shooting from the passenger window over the top of the car while Linda tried to maneuver me into position – what? don’t you know that is what UBs’ do!?! I better go work on my photography game – have a great day! Orioles!! Matthew and I always looked for Orioles when we used to go birdwatching. One would often hang out very high in extremely tall tree in the preserve around here, but we did get shots of it down low a couple of times. Once we were leaving after a long morning and were lamenting the lack of Orioles when one landed on the fence post right next to us and looked at us. I’ll never forget that. And he stayed there while we took pictures. This may be the only case where we have better pictures of a bird species than you do. I didn’t know why they are called Baltimore Orioles. And I still don’t know why they’re called “Orioles”. They are really beautiful. Their song or call or whatever is supposed to be very pretty, but I find it so-so. They do stand out when they’re flying with their brilliant orange color. I notice you didn’t provide the usual information on the coloring of the female–I assume they are more brown. I’ve been challenged to get better pictures!! This might take a little while based on how infrequent we get to see them around here, but I’m never one to back away from a challenge. I should have mentioned the females also display the orange coloring (adults) but their black markings tend to be a little more dustier – you can spot the females adults pretty easy because they will not have a solid black head, rather some orange streaking will be present. The juvis do not appear to have the distinct black markings sporting a more overall yellowish palette like a large Goldenfinch. So, unlike most highly colored male birds, their mates are the usual drab brown (yeah for them!) Ironically, the first shot was of an Oriole high in the branches, but the fuzzy ones at the end were strangely hanging out in the brush.